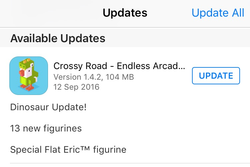 The Crossy Road Dinosaur update added 13 new Crossy Road Characters. The total character count went up to 184. There are 12 new characters and 1 new secret character. The characters, which can be obtained by the prize machine are: Dinosaur Chicken, Stegosaurus, Thesaurus, Parasaurolophus, Archaeopteryx, Tyrannosaurus Rex, Palaeontologist, Triceratops, Dilophosaurus, Pachycephalosaurus, Unexpected Shrew and Flat Eric. Please note, that Dinosaur Chicken and Flat Eric are free for a limited time. ​If you know how to unlock the new Crossy Road Dinosaur Secret Characters, let us know in the comments!